Online marketers using the trusty Google Keyword Tool may have noticed an alert at the top of the page, letting them know that in the next couple of months the tool is going to be eliminated. However there’s no need to fear just yet, as it simply means Google is herding users towards a new product instead – the newly titled Google Keyword Planner. 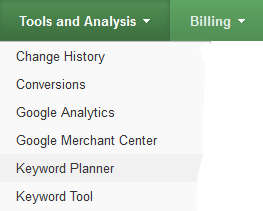 The core difference of the Keyword Planner is that it is tied to your AdWords account. Unlike the Keyword Tool where you could search anonymously so long as you entered a Captcha code, the Planner requires you to be signed into your AdWords campaign account. The idea is to combine different existing functions of the AdWords analysis tools into a single unified place, making them easier to access and integrate with your campaign. This may not be welcome news to SEO marketers, who don’t necessarily want a full AdWords campaign, just the numbers on certain keywords and phrases. However as long as you have an account registered with AdWords (even if you aren’t actively using it) you can search for phrases on any term in any location. Simply select the Keyword Planner from the drop down menu, and choose to Search For Keyword And Ad Group Ideas. This will take you to a page where you can enter largely the same information as you would have on the old Keyword Tool, plus a few extra options specifically for AdWords. This will then bring you to a page of Ad Group Ideas – switch over to the next tab labelled Keyword Ideas to get the list of keyword suggestions you’re used to. Click on Avg. Monthly Searches to have them sorted by highest traffic, rather than just their AdWords potential. Unfortunately the Competition column now applies only to how many people are competing for adverts, rather than how desirous in general the keyword is. There are a few little extras to sweeten the deal however – clicking the graph icon next to the keyword allows you to track its search volume over several months at a glance, and there are options to import lists of keywords to get data on. Depending on your needs it may be enough to keep you going, but some SEO specialists may find they need to look elsewhere to get the dedicated tools they require. SEOmoz Keyword Tools – Some free tools but the excellent keyword analysis tool requires a Pro membership. UberSuggest – A free tool that helps you amass raw keyword ideas. SEMrush – The free tool offers important data including a total number of results for the term. Keyword Spy – Best used for AdWords as it allows you to “spy” on competitor domains and find out which keywords they’re targeting with their budget.